Board of Supervisors violate the law – Again! Once again, on June 2, 2015, the El Dorado County Board of Supervisors violated the Brown Act. Supervisor Ranalli should have recused himself from voting on the Bassi Road Bridge project because his home and winery are physically located off of Bassi Road, which means he will financially benefit from the project. The Board did not acknowledge that the staff excluded testimony from the indigenous Miwok Tribe regarding the possible desecration of native cultural resources. Therefore, the agenda did not include attachments and full disclosure for the the public to view testimony regarding the desecration of cultural resources. lanes and 3-foot shoulders on each side. 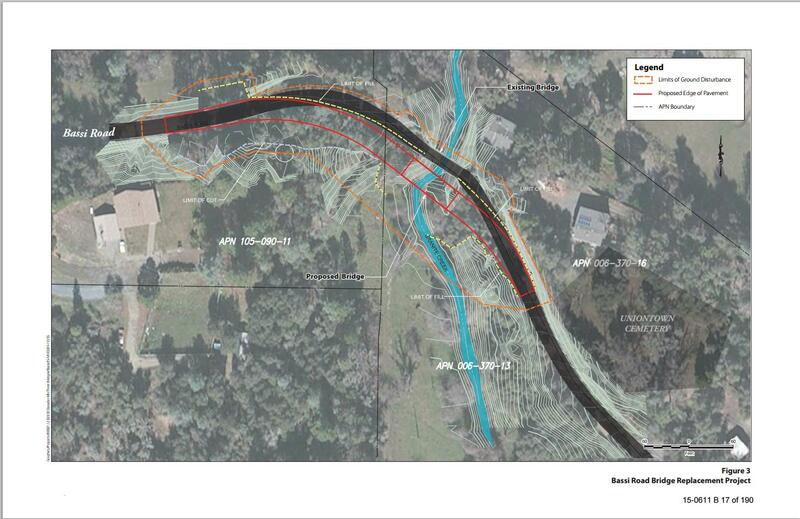 The proposed bridge would be located just upstream of the existing bridge. This letter is to call your attention to a violation of the Ralph M. Brown Act, which occurred during the El Dorado County Board of Supervisors meeting on June 2, 2015. Bridge Program, authorized under the 100 percent Funded Program. The action to approve the above agenda item was not in compliance with the Brown Act because the Board did not reveal to the public that Supervisor Ranalli’s personal and business property is located at the end of this road and that he would personally and professionally benefit from this road improvement. In addition, the Board Packet for this agenda item excluded pertinent testimony from the Cultural Preservation Officer for the indigenous Miwok tribe. This agenda item was misleading due to its omission of pertinent information in the agenda packet and due to Supervisor Ranalli’s omission to divulge his personal and professional benefit from the project. Accordingly, the Board of Supervisor’s actions to approve and certify the mitigated negative declaration were in violation of the Brown Act. 4. Supervisor Ranallli must recuse himself due to his conflict of interest when this item is returned to the agenda for the Board’s consideration. As provided by Section 54960.1, you have 30 days from the receipt of this demand to either cure or correct the challenged action or inform Sue Taylor of your decision not to do so. If you fail to cure or correct as demanded, such inaction may leave the public or interested parties, such as the indigenous Miwok tribe, with no recourse but to seek a judicial invalidation of the challenged action pursuant to Section 54960.1, in which case interested parties would seek the award of court costs and reasonable attorney fees pursuant to Section 54960.5. Click here for a copy of the Cure and Correct letter in PDF format.